Fig. 1: Cis elements in FGF2 required for unconventional secretion from tumor cells. As illustrated below (Fig. 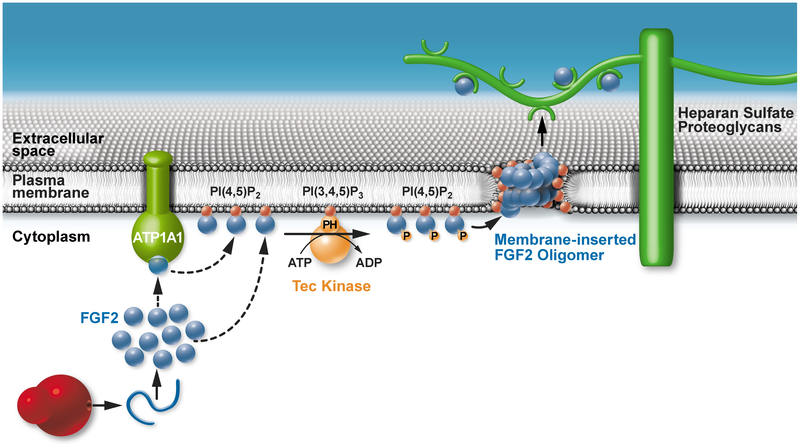 2), unconventional secretion of FGF2 occurs by direct translocation across plasma membranes, a process that involves sequential interactions of FGF2 with ATP1A1, Tec kinase and the phosphoinositide PI(4,5)P2 at the inner leaflet of the plasma membrane. The interaction with PI(4,5)P2 causes FGF2 to oligomerize and to insert into the plasma membrane forming a toroidal pore. Membrane inserted FGF2 oligomers are believed to serve as translocation intermediates that are disassembled by heparan sulfate proteoglycans at the outer leaflet of plasma membranes. This process results in directional translocation of FGF2 from the cytoplasm into extracellular space. 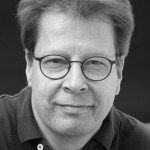 Current research goals in the lab relate to the spatio-temporal coordination of FGF2 secretion in living cells, the analysis of the molecular mechanism by which FGF2 physically traverses the plasma membrane and the relevance of this process for other unconventional secretory proteins such as HIV Tat. Finally, the molecular mechanism of FGF2 secretion is used in the lab to develop inhibitors of this process with great potential for the development of drugs for cancer therapy that block the function of FGF2 as a tumor cell survival factor. For further reading please download the review articles (download pdf) below.